El-Afwein(ANN)-“Contentious brothers lose wealth, bring about more graves”, Sheikh Abdullahi Ali Jawhar, a prominent, well-respected elder and statesman not only in Awdal but all over Somaliland and the Chairman of the El Afwein Mediation Committee, told his listeners giving the conflicting clans no parallel choice to a complete acceptance of the resolution reached. Sheikh Abdullahi hoped that El Afwein would see no more strife between the related, conflicting parties resident in the area. 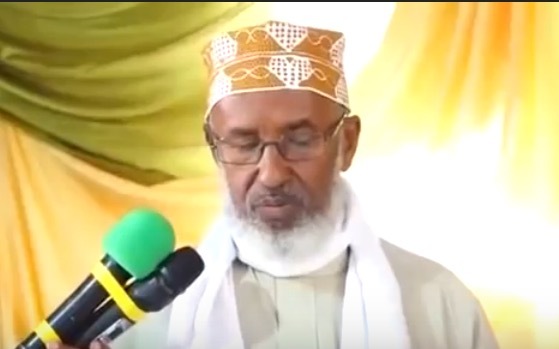 Sheikh Mohamed Omar Dirir, one of the most revered Islamic scholars in Somali-inhabited areas, also speaking before the resolution points were read out, revealed that ninety percent of the agreement came from the conflicting sides based on mutually verified issues. Sheikh Dirir expressed confidence that the agreement reached will be executed as laid forth since adjudication was based in Islamic precepts and faith. Sheikh Ismail Hurre, Committee spokesman, read out the Committee’s final settlement. The resolution, Sheikh Ismail stated, recognized the conflict as Haram, illegal, unconstitutional and the cause of unacceptable communal strife and a degradation to co-existence and cohesion of the community. Secondly, the Committee adjudged that all settlements reached on loss of life reached before the latest clashes erupted should be implemented as signed. The Committee, specifically, underlined three agreements the leaders and elders of warring sides penned on 2 September and 9 September 2017 in the presence of mediators, and decisions a mediating committee assigned to the conflict by the Somaliland Guurti House (Upper parliament) set forth on 12 September 2017 and 10 March 2018, respectively. Thirdly, the Committee took note of people killed on both sides of the conflict, ascertaining that 11 men and a young girl were killed of Sa’ad Yonnis, and that full Dia must be paid them by the Bi’ide Yonnis clan who, themselves, lost 9 men as a direct consequence of the armed confrontations. What was more striking – and totally refreshing and original in the Committee’s resolution on the issue of Dia payments – was that deaths on each side must not cancel each other as was, usually, adopted in previous resolutions. “The immediate family (inheritors) – not the overall clan – of the killed must receive the Dia,” the Committee decided, a point that would heal the pain of bereaved families who will no longer live with a physical loss of a member and the absence of compensation, thus mitigating chances of vengeance and retribution in kind. The resolution established that 67 people of the Sa’ad Yonnis clan and 69 of the Bi’ide Yonnis were being treated of various wounds and injuries and that material compensation depending on the degree of severity of wound would be paid to the casualties once the wounds properly healed as was stipulated by the Shari’a. Finally, the Committee ruled water and grazing were God-given, common assets that should be shared without rancor or rivalry, and that no new settlements be started without due permission from the central government in order to avoid more land, water and pasture rights. Anybody or clan found armed or in violation of the decisions adopted was a matter for the government and its law enforcement organs to take a swift action of, it was concluded. Both sides accepted the Committee resolution completely and without reservation.